Why Do Most Songwriting Techniques Leave Your Songs Boring And Lifeless? Are you using songwriting techniques that don't help you get the results you want? Or are you using techniques that only use a tiny fraction of your potential as a songwriter? What would you say if you discovered some "small tweaks" that could massively improve the quality of your songs? Ok, here’s why most common songwriting techniques fail: They encourage the use of the ANALYTICAL part of your brain. It’s a common belief that to come up with great songs, you need to sit there and “think them up”. However this idea is VERY bad for your creativity. Anytime you “try” and think up a solution to ANYTHING, and that includes creating music… you are inviting your analytical resources into play. In this mode you are thinking about the “rules” of music, such as how a chord progression is supposed to go… or what notes you’re allowed to use in this particular situation. As soon as you start looking for “rules” to writing the perfect song, you are getting into trouble. The thing is: a “rule” is something that describes an observation. Do you think gravity would still exist if scientists had not explained how it works? You probably realize that the EFFECT of gravity would still exist. It may not be called gravity, but it would still be pulling everything towards the ground. And from here this person created “rules” that seemed to explain what was happening in the music. The thing is: this great song exists whether the “rules” have been created or not. People began to believe that if they knew the “rules of music” then they could simply follow them and write song after amazing song. Unfortunately, this is the biggest mistake a songwriter could ever make. If you are using “rules” to try and write songs, you are engaging the wrong part of your mind. You see, applying “rules” to something is an ANALYTICAL task. And the analytical part of your mind isn’t where your best songwriting resources exist. The parts of your mind that are CRUCIAL to creating inspirational music are your CREATIVE resources. And you can’t engage your CREATIVITY while being in ANALYTICAL mode. So if this is true (and it is) then how can you avoid this “sticking point” that plagues so many songwriters? What you need to do is take your attention OFF any songwriting ruleswhilst you are creating. When you do this, you open yourself up to a world where there are no limitations. In this world of “no limits” it’s possible for you to tap into your more powerful creative resources… which is where your most brilliant ideas lie. It’s actually possible to program your unconscious resources to create music while you’re doing other things. Your unconscious resources are where most of your creative power lies, and once you can “assign tasks” to it, your potential as a songwriter will be multiplied tenfold! This may sound like a pretty “far out” concept to you… but I assure you it’s not hard to do, and you won’t believe the results when you try it for yourself. When you do this you will find that musical ideas will come to you out of thin air. “You hear the words, everything is there in front of your face… That’s why I hate to take credit for songs I’ve written. I feel that somewhere, someplace, it’s been done and I’m just a courier bringing it into the world. This is a great example of an idea that has been created by Michael’s deeper, creative resources that are outside of his awareness (His unconscious resources). Notice that he doesn’t actually feel that he did the creating. And many musical “geniuses” feel this way because they don’t realize they are “unconsciously creating” their masterpieces. The truth is: Michael DID create this song. He just wasn’t aware that he was creating it at the time, BECAUSE it was very unconsciously driven. In my book “The Songwriting Genius Within You” I take you through easy songwriting techniques that will harness the full power of your creative mind. 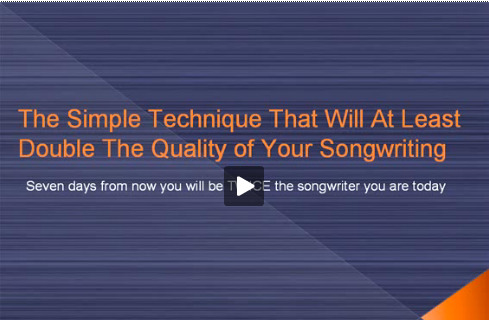 You will learn how to “assign” songwriting tasks to your unconscious resources. This is a way of songwriting that works like crazy, and when you use it you will unleash your spectacular full potential as a songwriter. And you’ll also glow with pride at the music that you’ll create as a result. If you haven’t read my book yet, but you’re interested in becoming the best songwriter you can be, you need to go get it right now. I promise it won’t be like any other songwriting course you’ve taken. The songwriting techniques in the book will show you how to get out of ANALYTICAL mode (perhaps the biggest mistake most songwriters make) and get into CREATIVE mode.